Studio Four were approached by the RNLI to assist with the relocation of Margate lifeboat station. The existing station had been adapted over the years to house the current lifeboats but was extremely cramped owing to the significant advances that have occurred in lifeboat technology since the building was originally constructed. Margate lifeboat station currently sits ‘behind’ the new Turner Contemporary and the launch route, around the Turner frontage, is difficult and time consuming. The Mersey-class all-weather lifeboat (ALB) is also due to be replaced by a modern, more capable Shannon-class, which is part of the RNLI’s strategic plan to have all ALB’s capable of 25 knots. The proposed lifeboat station sits elevated above Margate beach outside the flood defences and the new flood defence wall, which wraps around the new building, forms a key element of the scheme. The dynamic pair of mono-pitch standing seam roofs over the vertically timber clad facades creates a simple seafront building nestled in the sweep of Margate bay. 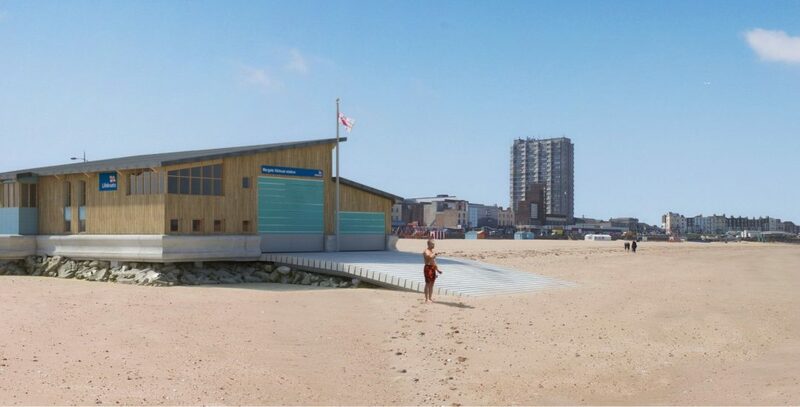 The busy tourist beach also has an RNLI lifeguard unit, which will now share the new building with space for the lifeguard’s vehicle, boat and other equipment. Margate itself is undergoing major regeneration in the form of the new flood defences, Margate Turner Contemporary, the Dreamland complex and, it is hoped, the new lifeboat station will continue this process. Studio Four were initially approached to carry out a feasibility study to consider how the building could better help them fulfil their mission to the local community. The brief was to provide a replacement community centre incorporating a hall and large meeting room for use by local clubs, committees and regeneration organisations. Following completion of the Bradley Stoke Leisure Centre project, Studio Four assisted Createability and Alliance Leisure to provide South Gloucestershire Council and the Circadian Trust with improvements at this second leisure centre outside Bristol. This scheme provided a replacement community centre in Milford on Sea, which opened to the public in Sept 2010. Planning permission has now been granted for a new lifeboat station at Llandudno in North Wales.